Yesterday was absolutely great – we had a surprise activity that took us all over the place, and I loved it. I won’t divulge any secrets, just in case future program people are reading this. Trust me, you will appreciate me not spilling the beans. Today was the most relaxed day so far. 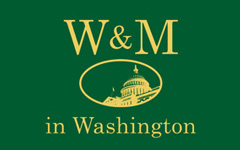 We had a meeting with the head of the W&M Counseling Center on how to deal with stress and a new way of life in DC. It was really entertaining and I got a lot out of it, which was great. We talked with Roxane and Morgan for a bit after the program, and got information on emergency procedures for any kind of emergency possible. Directly after the meetings, I went to my internship office to meet with my supervisor. Since we had some scheduling difficulties as far as my starting-date was concerned, I was glad that I learned how to navigate the office and got the basics on what I would be expected to do and with whom I would be working. It was great to get a trial run on the metro too! I got back to the apartment at around 6 and had almost an hour to relax. At 7, a group of us went to see a Nationals game, which was a lot of fun, despite the rain. Food there was expensive, so my roommates and I planned on going to Thai after the game. After waiting on the metro for what felt like eons, we finally got back to Crystal City, but the Thai restaurant was closed. Half the group went to a kebab restaurant down the street (it’s open 24 hours a day) and I went back to the apartment and heated up one of the frozen meals I made myself before the trip. Now I’m watching the Obama speech, which is definitely interesting. All in all, it was a pretty great day.